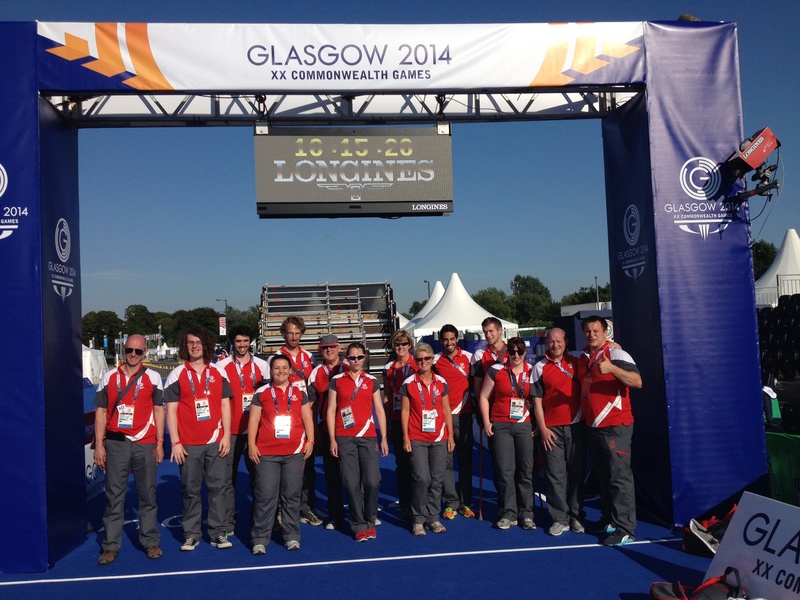 I’ve just spent two of the most enjoyable weeks of my life as a volunteer at the Glasgow Commonwealth Games. As a sports event organiser and serial volunteer it is no surprise that I applied to be a “Clyde-Sider” but when I made the 800 mile round trip for my interview early in 2013, I had a rough flight, a bumpy landing and a cold wet day. I remember sheltering in the relative warmth of the People’s Palace and wondering if it was such a good idea. When my shift roster arrived I was delighted to see that my sports were Triathlon, Mountain Biking, Marathon and Road Cycling. The role said “Results Technology Services, Transponder Team” and the cynic in me imagined a back-room job sorting timing devices. Oh no! If you watched the BBC coverage of the Triathlon Relay, you might have seen that I put in nearly as many appearances as Alistair Brownlee. Our team was issuing and collecting timing transponders and that meant fixing them to bikes or athlete’s ankles before the start and removing them at the finish. It was an exciting role with a front row view of the action. I camped at Lochinch in Pollok Park, in a small tent (2 seconds pop-up: 25 mins not-pop-down!). Camping Ninja ran a good ship – it felt secure and they did their best to provide enough charging points for all the phones. And they supported Project Recamp to reuse and donate camping equipment at the end. The Lochinch Sports Club volunteers and staff worked hard to look after us and battled manfully to keep a supply of hot water to the showers. I only had one cold one. They provided food service, although I had always left before breakfast which started at 7.00am. And there were big screens to watch the sporting action until 11.30pm when they turned them off and sent us out to our tents. With the help of friends, thank you Debbie and Elizabeth, I arrived by train and was reunited with my tent, bike and uniform. 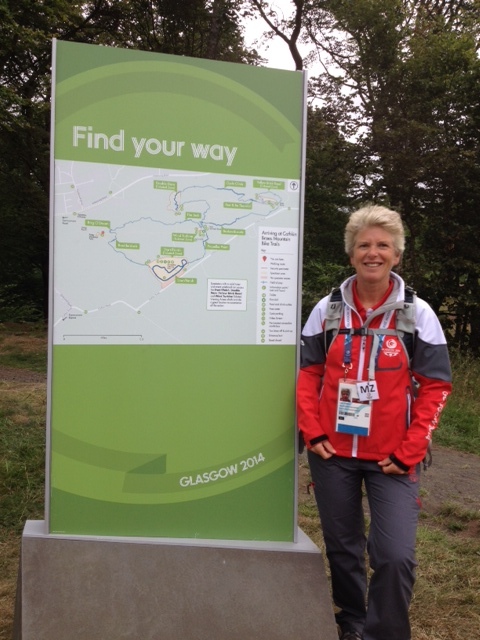 I embraced the Glasgow 2014 ideal of “active transport”, and set out to cycle to all my shifts. 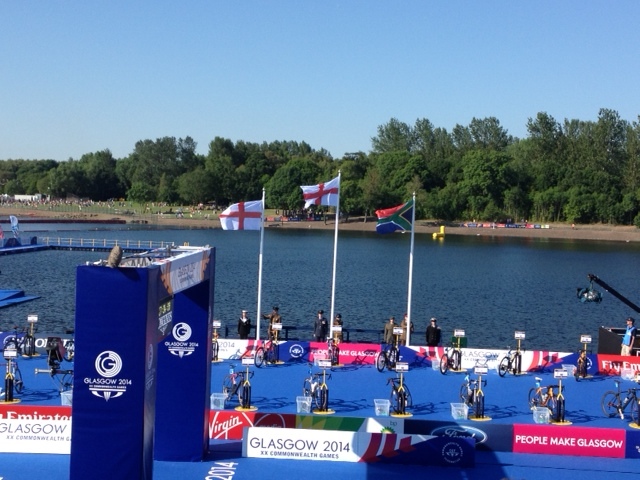 The triathlon in Strathclyde Country Park was always going to be a challenge. So I set off extra early with route details and a borrowed OS map (thank you Christine and Malcolm). Three hours later I arrived at the athlete check-in gate of the triathlon venue. The transport and security teams who greeted me were in awe of my determination to battle the (unsigned) diversions around the Glasgow Green venue and the athlete village. 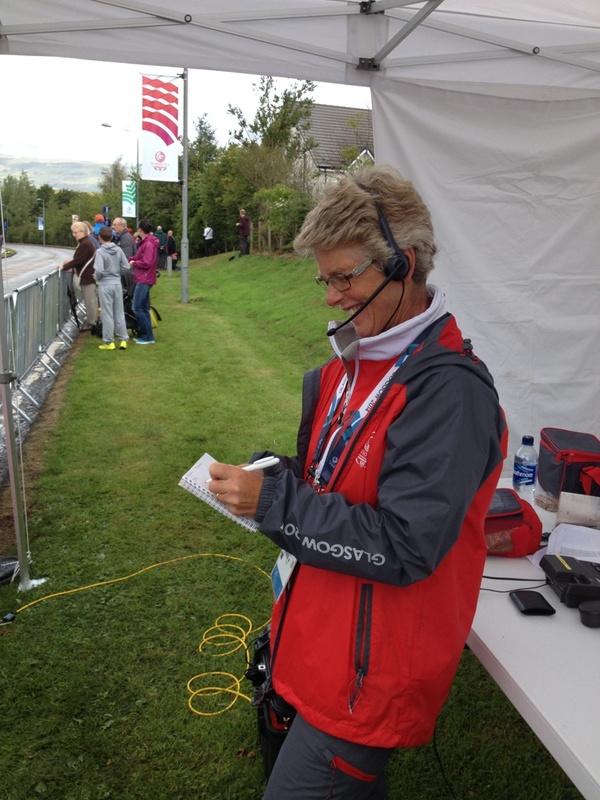 I went down in history as the mad cycling volunteer who put in more hours on a bike that the competing athletes! Security kindly looked after my bike and Transport put me on an athlete bus to the other end of the park – which was closed to all other traffic for the event. 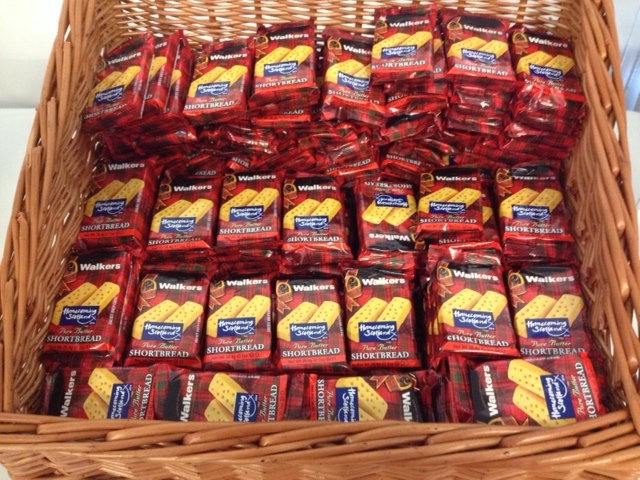 The staff at Workforce Check-in rallied round to find me a breakfast of a banana and a “Lees Original Macaroon”. Not a macaroon as I know it, but if I ever come across one of these again I will be transported back to Strathclyde Loch. I was inauspiciously late joining the timing team but luckily this was a preparation session. The next day I modified my transport plans and combined cycling with the train to Motherwell. It was a pleasure to work with these athletes and they confirmed my belief, formed in my early days with aat events, that triathletes are generally a very reasonable bunch of people. Before the start of the team relay, Jonny Brownlee appeared in the changeover area with a pair of scissors, and asked me if he could shorten the transponder straps to stop them flapping about. He did his, and his brother’s. Impressive race preparation. I later recalled that after the individual event there had been 4 straps that were too short to fit back on the rack they came on. We now know why. The blistering sunshine in the first week warmed the water above the temperature that wetsuits were optional. 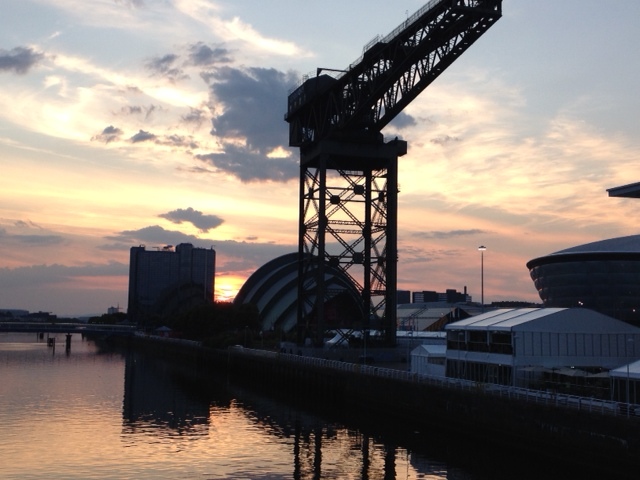 Yes, in Glasgow the water was so warm that wetsuits were forbidden by Triathlon rules. I also heard reports of melting tarmac on the bike route. There were industrial sized containers of sun-screen for volunteers to help themselves at breaks. On the train journey home from the relay, I enjoyed a lively conversation with some David McNamee fans. They could see what a great time I was having, and how passionate I was about organising sport at all levels. (They assumed I must work in a school – irony, Mr Gove). One of the triathlon fans mentioned that he had considered volunteering but ultimately had not because he felt it would be a big anti-climax when it was all over. Yes it really is. But there are solutions – there’s a topic for a future blog post. The marathon route came right through our camp-site. Handy for spectators but I had to get up at 5.00am to cycle to the event HQ. I was somewhat dismayed to find out, after check-in, venue tour and team brief, that our team was overstaffed and one of us could go home. As I’d had such a great role at the Tri relay I stepped down. But by this time all the roads had been closed. I might have had a lie in and a short stroll to cheer the runners through Pollok Park. Never mind. I understand it’s hard to plan such complex volunteer schedules. Instead I went back to the People’s Palace which was now the workforce rest area. This spectacular greenhouse which had provided some warmth and shelter in the winter was – well, like a greenhouse! I sat down in a comfy chair and fell fast asleep and missed the marathon completely. The Mountain Bike venue also presented transport challenges, not least the 400m climb to the top of Cathkin Braes hill. So I settled for the bus – did my research on the way home from the marathon to check the bus stop was not on a closed road. The very helpful bus driver set me down in a random housing estate and told me to head off uphill on a minor track. Better luck than at the triathlon, I arrived straight to Workforce Check-in. It was an awesome venue and the huge wind turbine and buzzing helicopters added to the atmosphere. My job was again working with the Longines timing team and here on the 80% gate where athletes that drop behind are pulled or retire. Some were clearly outclassed. Others were frustrated. But I was surprised at the reaction of the crashed and bloodied Isle of Man rider who punched the air with joy when his team manager told him that his crash had been replayed several times on the big screen. If seems if you are going to crash, you want people to see it. Radio communications presented an unexpected challenge for me as all messages were in German. Most of the numbers came back to me, but who would have thought I’d have needed a European language at the Commonwealth Games in Scotland. A day off – and someone gave me an athletics ticket. Thank you 🙂 And other priorities were washing clothes and bike repairs. For the cycling time trial we were asked to meet at Commonwealth House in the City centre, the venue for my distant past interview on that chilly day. We were sorted into sectors, slowly, and bussed out onto the route. 7.30am check-in; 10.01am race start. we were in place and set up with only minutes to spare, a reminder that it takes a long time to organise so many people. We were dropped into the middle of nowhere, in pouring rain. Our uniform rain jackets and umbrellas were good, and our trousers were quick-dry, but I was relieved to see a gazebo at my timing station. My job was to record the cyclist numbers and make sure the back-up info was radioed to Longines timing HQ – this time thankfully in English. I must have been inspired by all that cycling. 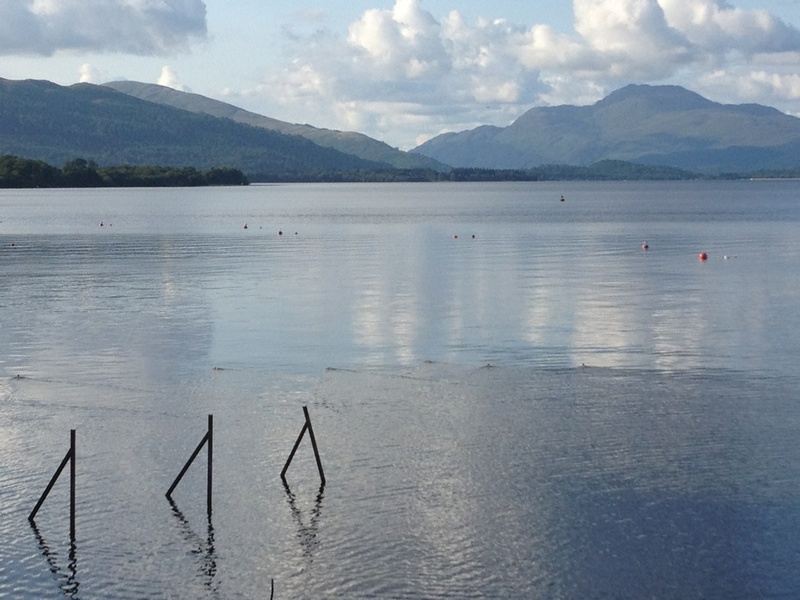 Next day off I embarked on an excursion to Loch Lomond and the Trossachs National Park. 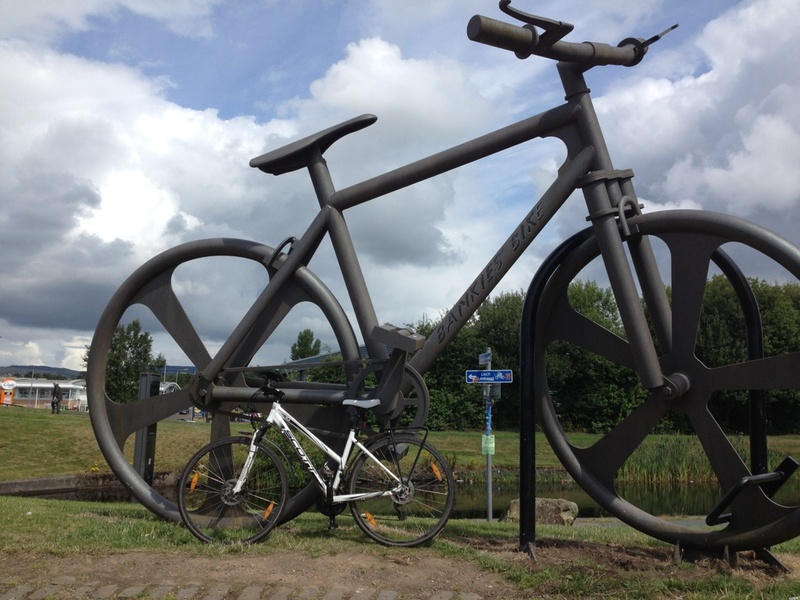 It was a splendid cycle along Sustrans NCR 7 which followed the Forth & Clyde Canal and the River Leven. A chance to run in the Pollok parkrun on Saturday – don’t forget your barcode! And then my final shift was the Cycling Road Race where we were removing transponders from some very expensive bikes. But what I will remember most is the teamwork, the camaraderie of the campsite and the amazing friendliness of people in the city. If you were in uniform people wanted to talk to you. I cycled in and out of the city at all times of day and night. They say “People Make Glasgow”. One of my favourite places to relax was the BBC at the Quay: A hub of entertainment, free bands, big screen and the studio where they recorded “Tonight at the Games”. I’d been lucky enough to see Public Service Broadcasting, Bellowhead, PAWS, Prides and The Radiophonic workshop. On the last night Debbie and I, and several thousand others returned for one last time to The Quay to watch the closing ceremony. Sad Glasgow 2014 is over. Will I be finding my way to the Gold Coast in 2018, I wonder. 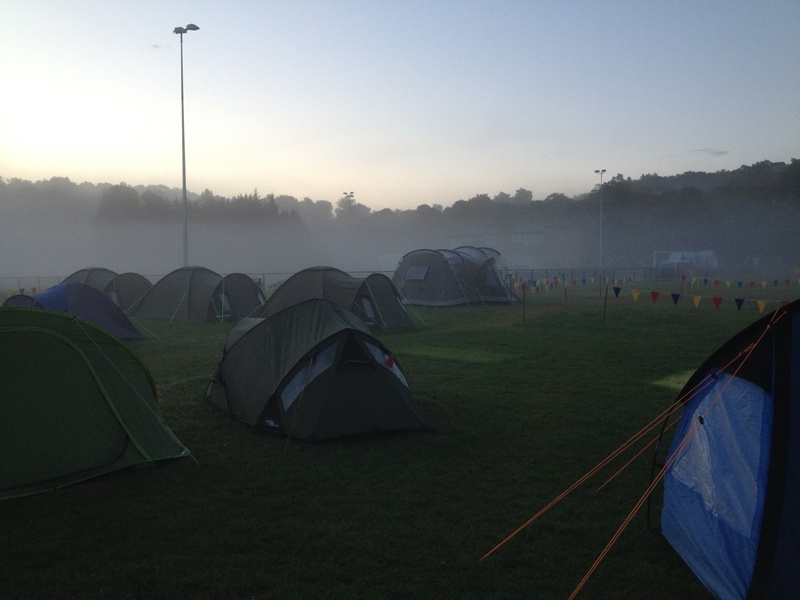 This entry was posted in Be a volunteer, Brilliant examples, Sport by Linda Cairns. Bookmark the permalink. Super write-up, I considered cycling around Glasgow but one sight of pavements with hand rails put me of that. We’re so please you had such a great time in Glasgow! What a fantastic blog too!